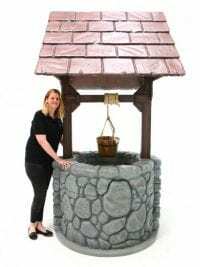 This is a realistic, really detailed 3D Wishing Well that we have for hire;perfect for any Medieval, Rustic or English Country Garden event or party. The well is freestanding and is even designed to contain water (although as you can see from the picture, it is only shallow)! 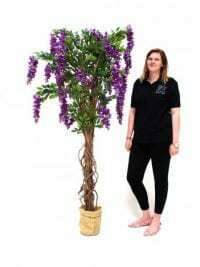 Artificial Wisteria Tree to hire. We also offer the Wisteria Tree with a purple flower. Take a look at this pretty Wisteria Tree with multiple twisted stems, green foliage and purple flowers. 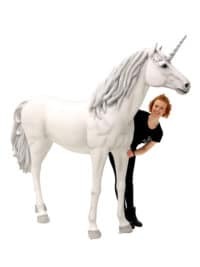 At 6ft tall it can be used across all sorts of themes at your party or event to help create a relaxed and attractive setting. 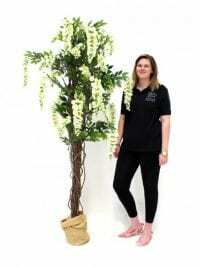 We also offer the Wisteria Tree with a cream flower. Witch Hat Hoopla Fairground Game for hire. Roll up roll up! 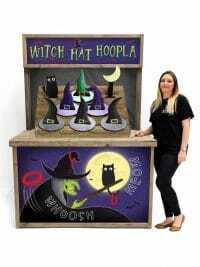 Test your aim with our Witch Hat Hoopla themed fairground game. Impress your guests and try and throw as many hoops as possible around the witches hats (hoops are supplied). 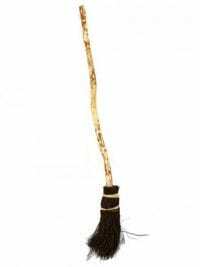 For all you witches out there please feel free to hire your broomstick from us! Can I just point out that our broomsticks are not just your standard household grade broom, adapted for unsatisfactory flight…..These are made from deluxe, hand-crafted, state-of-the-art, forest foraged, hardwood logs with go-faster Larch twigs to aid stability and aerodynamics mid flight. Please note: Laura (seen opposite) is only a trainee Witch so please ignore her takeoff technique….not textbook! Witches Castle Rustic Sign for hire. This is a freestanding (base not shown) broken-looking wooden sign, perfect for your Halloween or Witch themed event or party. Want a hanging version of this sign? Simply choose SN1961 instead. This is a wooden hanging sign which has been designed to look rustic and broken, perfect for your Halloween or Witch themed event or party. 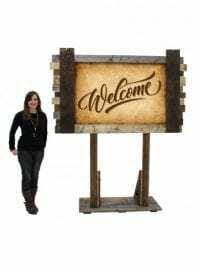 Want this sign to be freestanding? Simply choose HLW124 instead. The prop is supplied with hanging points. 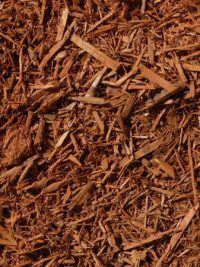 Wood Chip / Bark for sale. Our wood chip will really enhance the feeling of being in a wood, forest or jungle and is perfect to hide a venue carpet that would distract from any look you are trying to achieve. You will receive approximately 100L of wood chip. and the wood chip will be delivered in a storage container that will need to be returned to Event Prop Hire. 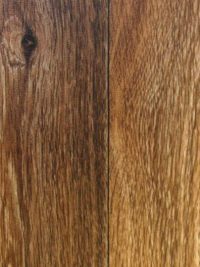 Wood Effect Vinyl Flooring for hire. Take a look at this lovely wood-effect vinyl flooring; perfect for all manner of themes from Apres Ski or Gentleman’s Club to Pirate, and anything in-between. It’s a good idea to talk to us about the type of surface you need to cover to ensure it’s suitable. Also, our talented staff can lay the floor for you if required – ring us now for a quote. Please note: all quoted prices are PURCHASE prices. If you require us to remove the vinyl from your venue then please discuss this with us prior to your event. Wood Panelled Drinks Bar to hire. 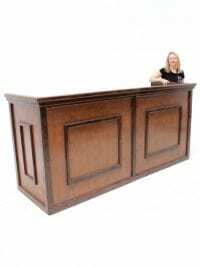 A smaller version of our popular Large Wood Panelled Drinks bar, this drinks bar to hire is perfect for any number of theming events such as a western saloon, gentleman's club or just a simple british bar front! Bar is of flatpack asembly, requires no tools, and can be built in a matter of minutes. 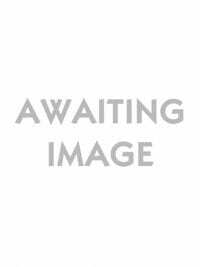 Mirrored shelves available as an optional extra – Call for more details. Black Wooden Back Bar Shelving Unit for hire. This back bar is available to hire on its own, but why not hire one of our bars too? We’ve a large range of bars that this back bar would be suitable for use with. 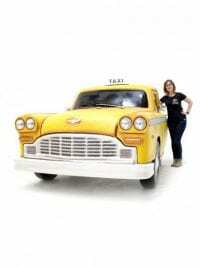 It’s perfect for any number of event themes, including Gangster or Halloween themes. The price quoted is for the back bar only. 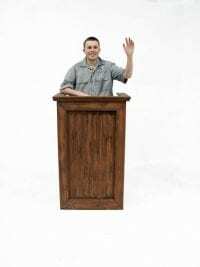 This Wooden Lectern is available to hire, and would be a great addition to any Medieval or Roman themed event or even if you just need to give a very important speech! Be sure to take a look at the rest of our Medieval themed props! 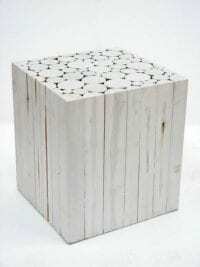 Wooden Market Stall Prop to hire. 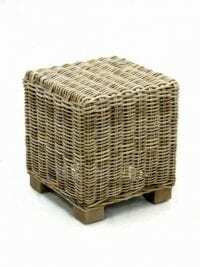 Perfect prop hire for any event that requires a market scene! 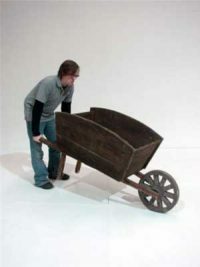 Wooden Mine Cart available to hire. 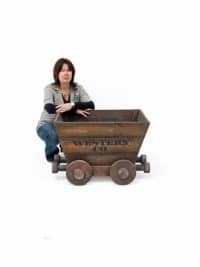 This Wooden Mine Cart would be the perfect addition to Wild West or Mine themed party. Why not take a look at the rest of our Wild West and Mining themed props? 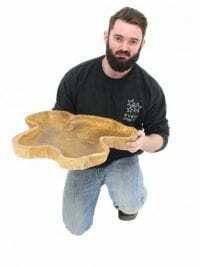 Take a look at this lovely crafted wooden platter. 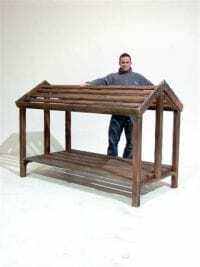 It would look lovely as a filler piece for any English Country Garden, Alice in Wonderland or Enchanted Forest themed event. Please note that each platter will vary slightly in shape and size. 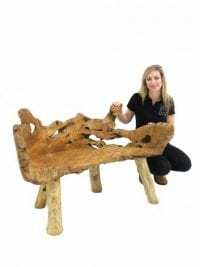 Wooden Root Bench to hire. These benches are made from genuine reclaimed lumber so each one is totally unique. They have wide appeal and are able to fit into themes that vary from Apres Ski themed events, to Caribbean themed parties, through to Jungle themed nights. Wooden Topped Black Steel Drum Poseur Table for hire. 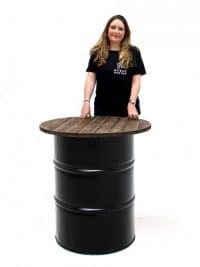 This metal drum complete with wooden top is the perfect prop to hire for your Halloween, Apocalyptic or Steam Punk themed event. Take a look at some of our other colours below. 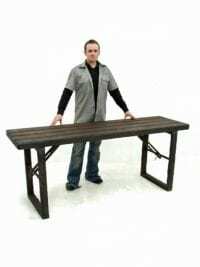 Wooden Trestle Table Furniture Hire. Finished in a rustic wood style, these wooden trestle tables would be great food serving tables for any number of themed events including a medieval themed party! Legs fold out and lock securely in place. A realistic wooden garden ornamental wheelbarrow. *Please note, this is not a working prop. 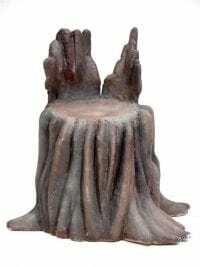 Wooden Wild Mushroom Set to hire! 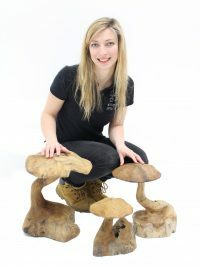 Take a look at these lovely hand crafted wooden wild mushrooms. 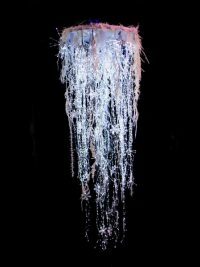 They would make fantastic filler pieces for any English Country Garden, Alice in Wonderland or Enchanted Forest themed event. 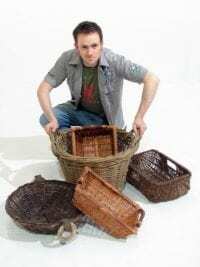 Please note that the price quoted is per set of three differently sized wild mushrooms and that as they are hand crafted, the shape of each mushroom is variable. 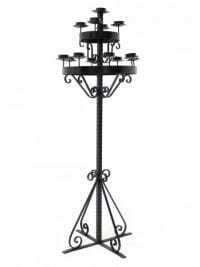 Wrought Iron Candelabra prop to hire. 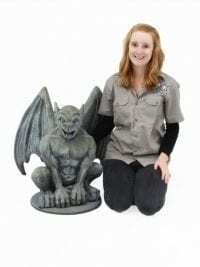 This candelabra prop is made from iron, giving it some real weight & authenticity to your Wedding, Medieval or Halloween themed party or event. We have designed and made the candelabra to accept a standard 3 inch diameter church candle or why not hire our own 3 inch diameter battery operated candles for a small extra charge. The candelabra requires 13 candles. 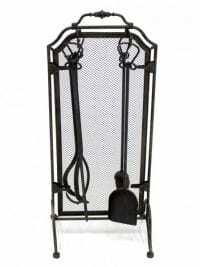 Wrought Iron Effect Fire Side Set to hire. One of these sets will definitely enhance any of our fireplaces. Complete with tongs, poker, spade and brush this item will really help set your scene. Zombie Sign Set for hire. 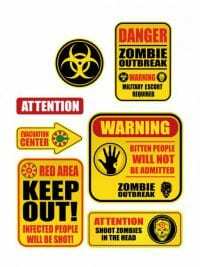 This set of signs will really help you to dress the scene at your Zombie Apocalypse or Halloween event or party! 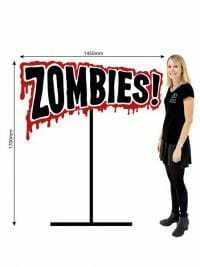 Hire this freestanding 2D sign to help set the scene for your Zombie themed Halloween event! 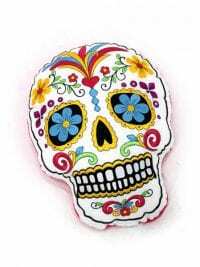 We've masses of props that would look great at your Halloween event or party so take a look through our Halloween themes today!